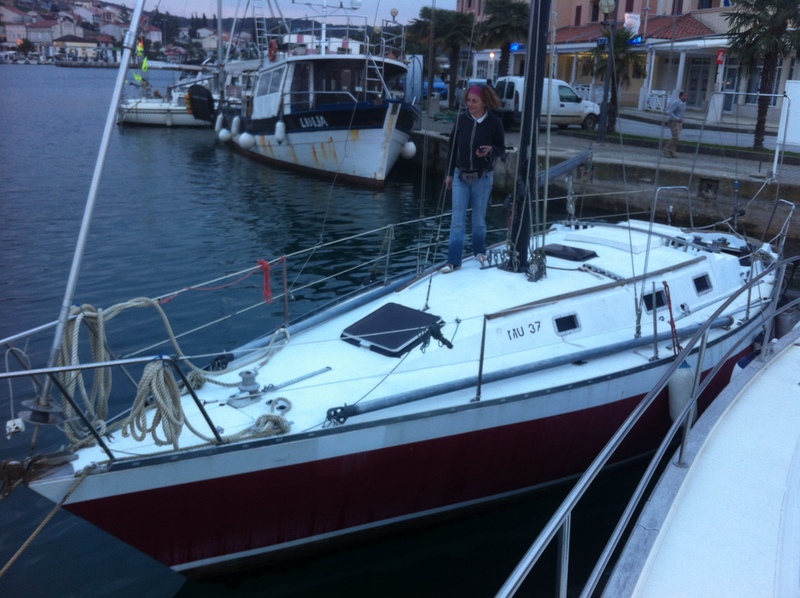 Last weekend I drove down to Vrsar with my friends to see the boat. She looked in even worse condition than I remember from last time, so it was time to get to work! Last weekend I drove down to Vrsar with my friends to see the boat. 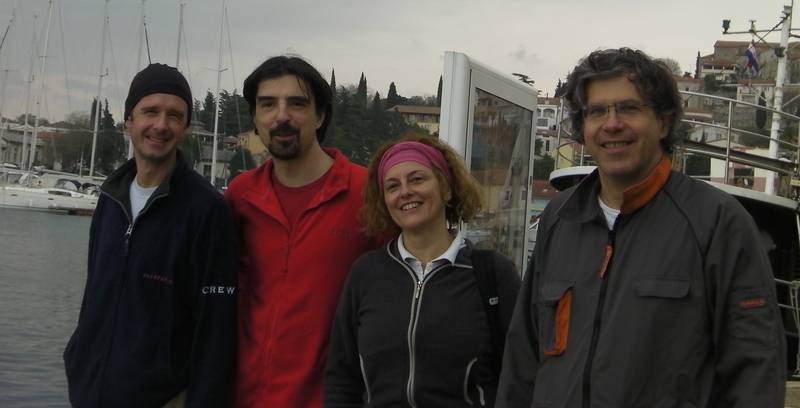 We went there on Friday afternoon after work and stayed with my friends (Andrej & Jelena) who live in Poreč. 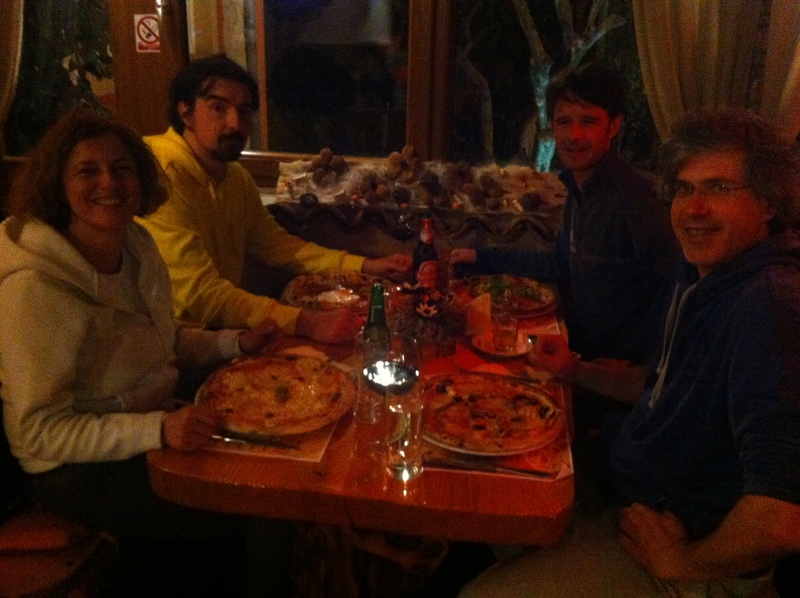 We had a great dinner, spent the night and on Saturday morning Andrej, Tomislav, Maja and me drove to Vrsar. She looked in even worse condition than I remember from last time, so it was time to get to work! 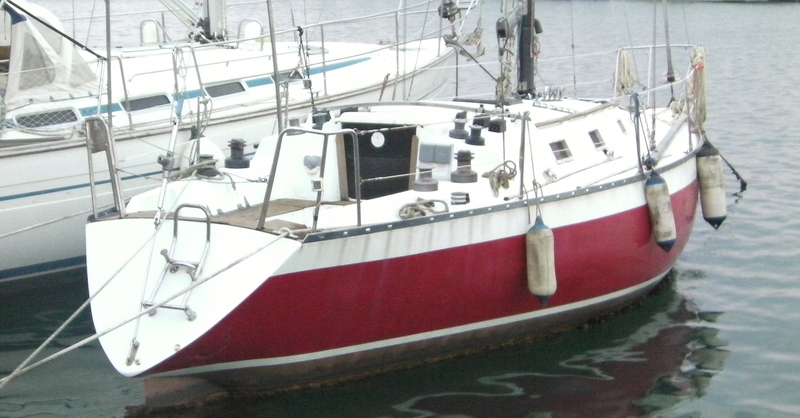 First, we took down the genoa that was in really bad shape, we removed all sheets, halyards and lines from the deck and started cleaning with a high-pressure cleaner which worked great. Andrej volunteered to do it. As soon as he started, he fell in love with the machine and he didn’t let anyone near it. Tomislav and Maja were fighting to try it. They got their turn after only two hours when Andrej got tired. We took one short coffee break in the bar nearby and one for lunch. We went to the supermarket, bought bread, cheese, mortadella, mayonnaise and beer (of course). We made sandwiches and drank geek on the waterfront and had a great time:)… but soon it was time to get back to work. I was the only one who dared to start working inside the boat. I had to put the mask and rubber gloves for protection and only then I could enter inside the ‘boat of horror’. 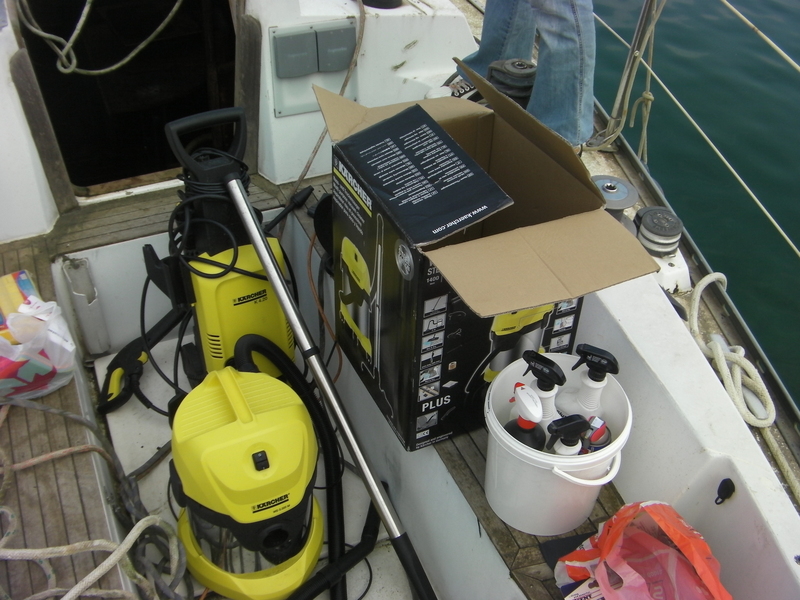 First I used a professional vacuum cleaner to take the water out (probably 300+ liters), then we took out everything we could from the interior and the guys started to clean them, while I was removing the mold inside. Working inside was really hard, so every so often, I had to get out of there and take a break. We worked all day long and wanted to continue on Sunday, but the weather forecast was really bad – gale force southerly wind and lots of rain, so we knew we had to do as much as we possibly could. On the outside she looks much better now, it’s still a mess inside (maybe a little bit better than it was before, though) and we took parts of the wooden interior back to Zagreb, so I can work also at home now. In the evening we went for a pizza and beer and then back to Andrej and Jelena where we talked, had a few grappas and went to bed. It rained during the night and the wind increased, so we treated ourselves with a long sleep, coffee and breakfast. Jelena’s mom invited us all for a big Sunday family lunch which was great. We had a great meal and really enjoyed the company. I hope you can really enjoy this turn around the word. I follow and I will see what happens with you and the boat. – Good luck ! What a story! And it is just beginning. Wouw. I will start following your adventure. Good luck!